South Holland’s has significantly improved its strength of innovation over recent years. This is shown by a recent study comparing the innovation s potential of Dutch provinces. The ING Bureau of Economics has validated the research & confirms the findings. 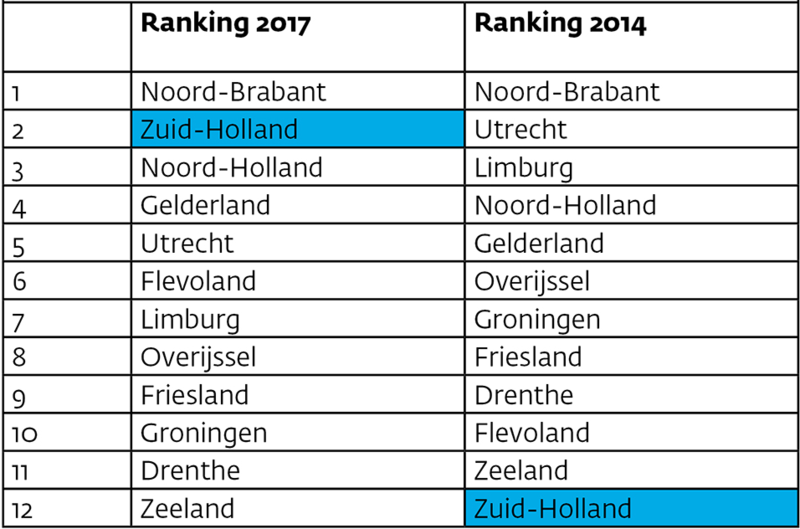 In 2014, South Holland was still at the very bottom of the list of innovative regions; now the province ranks second best, right behind Brabant. Thanks to substantial investments in innovation, above-average business dynamics and increasing labor productivity, South Holland has enormously improved its innovative strength. An important driver has been the sheer size of total investments made in innovative areas. Over the past two years, this has amounted to €2 billion, of which €750 million was raised by the public sector (governments and institutions). The share of investments from abroad has also been increasing: over 30% of foreign companies that settled in the Netherlands in 2017 opted for South Holland. In 2014, this was only 20%. The same study conducted in 2014 ranked South Holland last. This was one of the main reasons for the province to set up the regional development organisation, InnovationQuarter, together with the Ministry of Economic Affairs, large municipalities, and knowledge institutions. InnovationQuarter (IQ) now has three investment funds (€137 million in total) and was the most active investor in the Netherlands last year. In addition, IQ helps attract foreign companies to the region and boost complex collaborations and innovation projects with companies. According to Bom-Lemstra, InnovationQuarter’s efforts have “clearly strengthened” the innovation climate in South Holland, as is also evident from the latest IQ annual report. Governments, industries and universities in South Holland are also increasingly collaborating through new links, programs and agendas. Examples are the Roadmap Next Economy or the Investment Agenda for South Holland that was offered in 2016 to Prime Minister Mark Rutte. Over the past few years, the province has substantially increased governmental subsidies for innovations for small and medium-sized enterprises (SMEs). This term, a total of €28 million subsidy was granted to 364 innovative companies via this scheme. The province has also been committed to the establishment of organizations such as the space research institute SRON and the UN Climate Institute, “in part because these kinds of institutes can further boost innovation,” Bom-Lemstra explains.